I went to my first Passover seder when I was in college in Philadelphia. I was dating a nice Jewish boy from California who had some relatives living outside the city. Aunt Lulu and Uncle Stanley invited us over for the holiday and I knew it was special for my boyfriend to be with family and to be able to participate in the ritual meal. When I saw that the otherwise cantankerous Uncle Stan had a stack of food magazines, I knew we would be fast friends. Not surprisingly, he did most of the cooking that night and he did it with love. My first Passover meal did not disappoint. Everything was delicious, and not just because I was a college student who wasn’t eating homemade meals very often. I enjoyed my first brisket and charoset, the traditional chunky paste made from apples, dried fruit and nuts. I was putting it on everything, from matzoh to asparagus (even my oatmeal the next morning.) The showstopper was the Lemon Ice Torte that was served for dessert. It was featured in Bon Appetit that month (April 1991) and my boyfriend went crazy for it. The torte was an almond crust filled with a lemon sorbet and served with a strawberry-rhubarb sauce on the side. It was simple, but delicious, refreshing and apparently a welcome change from the ubiquitous brick of a honey cake that is usually served. I went out right away to buy a copy of the magazine (no internet yet, people) and my first springform pan so I could make it again. I can’t find the lipstick I bought last week, but I still have the same magazine and the same pan 20 years later. The boyfriend is still in the picture and I was lucky enough to marry him. Every year for 20 years, I have made that lemon ice torte for Passover with the same springform pan, but every few years I have added a new twist. I started making my own lemon sherbet when I moved to California. Wouldn’t you with all those amazing lemons? I dropped the layer of preserves from the original recipe and substituted fresh berries for the fruit sauce. More recently I experimented with sucanat instead of granulated sugar and coconut oil for butter. Sometimes, I’ll even surprise my family by filling the nut crust with homemade frozen yogurt on a day that’s not a holiday. To all my Jewish students and readers, have a beautiful holiday and remember ~ it’s never too late to start a tradition. 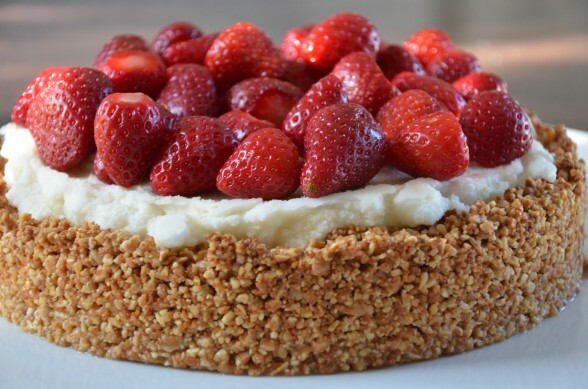 If the bottom of your springform pan is not attractive and you want to remove the torte to serve on a pretty cake dish, brush the bottom of a 9-inch-diameter springform pan with melted butter or oil. Line with parchment paper. If you don’t care what the torte is served on, skip this step. 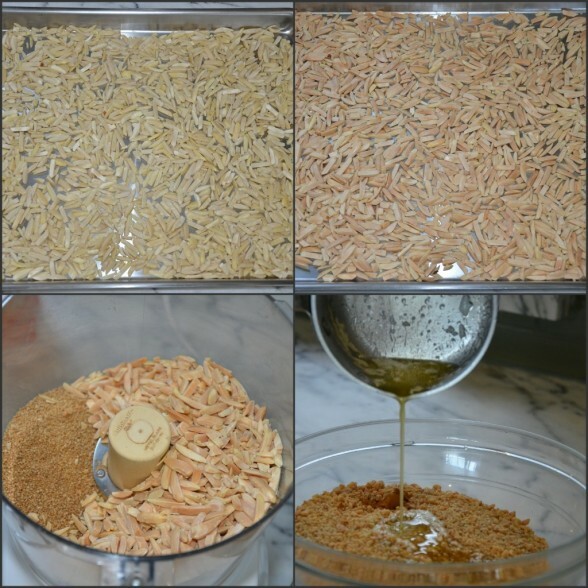 To make the crust: Combine almonds and sugar in food processor and chop finely. Transfer to a medium bowl. Add melted butter or coconut oil and cinnamon to almond mixture and combine well. Transfer to the springform pan. 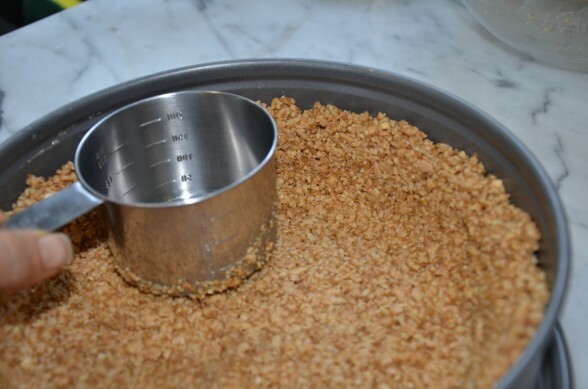 Press almond mixture firmly 1 ½ inches up sides and over the bottom of the pan. (A metal dry measuring cup can help do this.) Freeze 15 minutes. Preheat oven to 350 degrees. Place pan with crust on cookie sheet and bake 20 minutes. If crust slides slip, press back in place with back of a fork. Transfer pan to rack and cool completely. 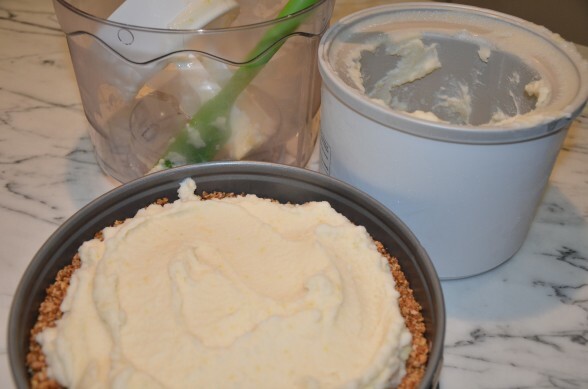 Soften lemon ice very slightly and spread over crust. Freeze until firm. When ready to serve, unmold sides of springform pan. If you lined the pan with parchment, you will be able to transfer (carefully) the torte to another serving platter. Garnish with berries on top and serve extra on the side, if desired. *To blanche your own almonds, place raw whole almonds in a heat-proof bowl and add boiling water to cover. Let sit for 2 minutes, but not longer or they will get soggy. Drain in a colander. The skins will slip off very easily. **To toast the almonds, place them on a cookie sheet in a 350 degree oven until lightly golden. Toasting freshly blanched whole almonds takes longer than slivered almonds out of a bag. The process can take anywhere from 8 to 20 minutes, depending. Watch them closely! Nuts can go from toasted to burned in seconds. Combine the water, sugar and two-thirds of the lemon zest in a saucepan and heat to a simmer. Cover and simmer 10 minutes. Stir in the remaining lemon zest and lemon juice and allow to cool to room temperature. 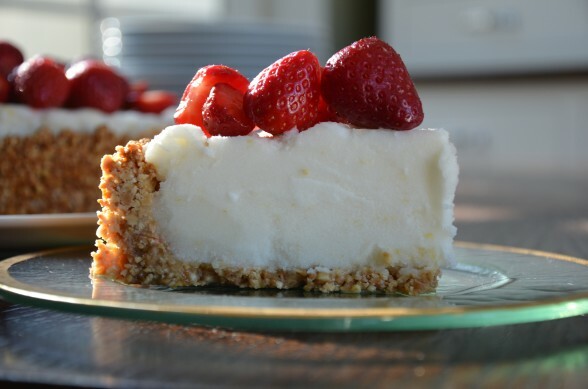 Whisk the cream into the mixture and refrigerate it until chilled, at least 2 hours. Freeze in an ice cream maker according the manufacturer’s directions. Hi! I am making the base of the torte on Wednesday and the lemon sorbet on Thursday… On Wednesday night do I keep the base covered on the counter overnight or in the freezer? Thanks! You’re amazing thank you for your quick replies!! Dearest Most Generous Pamela, Thank you for the recipes but thank you more for your touching stories and for the inspirations that are so lovely. Happy Passover. You are the sweetest, Andree. I assume I can use regular Coconut Milk in place of the heavy cream? The recipe looks fabulous! I love everything about it! I don’t see why not. I sub coconut milk for heavy cream all the time. It may have a slight coconut taste, though. could you give me a fat % on the heavy cream for the sorbet. here in quebec it is labeled quite differently. I have dinner tomorrow for 10/11… this should be enough? This recipe looks delish! I’m planning on making this for passover and would like to make this a few days in advance…does this freeze well? i.e if frozen for a few days, when it melts a bit, will the crust stay tasty or will it become soggy? Thanks! Yes, it freezes really well for quite a while if it’s covered properly. You can definitely make this several days in advance and the crust stays nice and crunchy (my favorite part!) Happy Passover! This was the favorite treat for Easter dessert. Everyone loved it, especially the texture of the nuts in combination with the lemon sorbet and strawberries. we had this with frozen yogurt and it was outstanding! so worth making! OMG! I made this recipe the same year, and I haven’t been able to find it since! So so so excited to see this! I’ve bookmarked it, and I’m making it this week! How cool! So you know how yummy it is. Oh wow! This looks incredibly delicious! Bookmarked to try out soon! Welcome, Mary! Thanks for stopping by! Can you do the sherbet in the vitamix if you do not have an ice cream maker? I have made sorbet in a food processor before, so I am assuming that you could do it in a Vitamix. You would freeze the mixture in a shallow baking dish until solid and then break it up into pieces. Place the frozen pieces in the Vitamix and process until smooth. Or you could just buy your favorite frozen dessert and soften it before spreading it inside the crust. Let me know how it turns out! Again, I have been fortunate enough to have had this on many occasions and it is fabulous. I am so happy to have the recipe!